Lizzie started her first year of Joy School back in September. The kids meet once a week, rotating from house to house of each Joy School kid. The moms all take turns teaching lessons and doing educational activities with the kids. We even go on field trips too! The last field trip they went to the pet store. They learned all about different animals and got to hold rabbits, guinnea pigs and rats. Mmmmm. I had the kids pose for a cute picture to send to the pet store employees as a thank you for a great field trip. Last week we were at Lizzie's house. We continued our "Water" theme and had fun learning all about water. We cooked with water and made Jello and juice. We played with water. We painted with water colors. We did a little science experiment with water - (we had to guess which objects would sink or float in our tub of water) they loved it! We love WATER! The kids so enjoye d the water colors painting. They painted for about 30 minutes - that's record time for a 3-year-old attention span. They were so intense! Trevor had his first ever Pinewood Derby last night. That's his car on the left. He has been so excited about the big race for a few days now that he hasn't spoken of much else. We spent some time this weekend working on the car. We made Trev narrow his designs (found on the web) down to a car that was doable. I cut the car, Trevor sanded it and Jennifer painted it. For being our first car, it turned out pretty good. Jennifer painted some flames on the side per Trevor's request. Trevor came up with a name for the car- "The Flamer", and unfortunately the name stuck and stayed despite his parents gentle suggestions that he might want to change it. I had concerns that Trev was going to be yelling, "Go Flamer, Go Flamer!" at the race. Thankfully that didn't happen. Check out the flamer doing it's thing below. As it turned out the car did pretty good. Trevor won all his races , although they still gave him second place. Email me and I will tell you our secrets, unless we will have to race you, in which case we can talk money- that's right I'm willing to throw it all for the right price. Anyway, Trev was pretty excited to say the least, although you couldn't tell by his goofy picture below. Grandpa Louie gave him a cigar box to store his car in. When he got home from the race, Trev placed the car in the box carefully treating it as a special jewel. There were some real fun other cars at the race, one carved like the golden snitch from Harry Potter and another that looked like a ice cream bar. Jennifer's parents and brother Samuel also came out to enjoy the fun. We now have one year to prepare for the next race, with our title on the line you know we'll be bringing it! The princess turned 4 today. She has been reminding Jennifer and I for the past few weeks that her birthday, "is on January 28th". We celebrated with a big Ward/Duran Family party on Sunday evening by eating Lizzie's favorite, pancakes for dinner. The house was packed, and with all the cousins in tow, and was quite loud. Lizzie also felt the need to parade around the house in 3 different princess dresses during her party, each time earning some oohs and aahs from the everyone. Matt preferred the green dress over all the rest. It was her moment to shine and she was going to take advantage of it. She also scored some sweet presents from everyone. Being that she is still very much in the princess faze of life, all the presents centered around something pink and pretty. She loved every minute of it. The party ended as every party should, with the boy cousins using a sling shot to hit the girls with peanuts. The party raged on today with Jennifer taking Lizzie and one of her best friends, Abby, to McDonald's for a birthday lunch. That was followed up with a small, Ward Family party, pizza and banana splits. By Monday night everyone was partied out except for Lizzie. 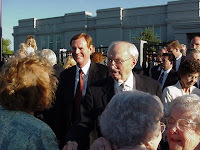 He came to Fresno and dedicated our temple in 2000. (Our temple was #99) We took this picture of him with our own camera! We could almost reach right out and touch him. That was a surreal experience to say the least. 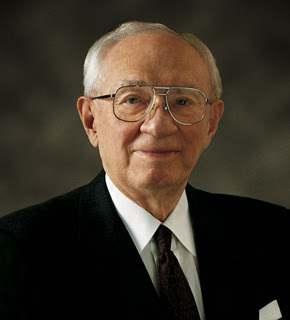 We loved his humor, his sweet wife and his passion for life. We're grateful to him for his service and sacrifice in our behalf. He truly was a great man and will be missed by us all. We took advantage of the day off today to take the kids to the fish hatchery in Friant. Grandma Karen and Grandpa Doug also came along on the outing. The weather has been great here lately, in the 60's, which made for a great day to be out in the countryside. The kids are always amazed at the sheer number of fishes, trout, that are swimming in in the shallow canals at the hatchery. Ya right, thousands of slimy fish and they think that kids are actually not going to touch the fish? They may want to rethink the usage of the word "molest" also. I took some scouts here once and they had a great time laughing at that sign. Apparently it means different things to them. Disgusting I know. They had a great time feeding the fish until they cleaned out every quarter that we and the grandparents had to purchase the food. Watching the feeding frenzy occur as they threw the food in drew lots of shouts of excitement. Jennifer put her hands in her pockets (making it clear she would not be touching the fish food). After a while, Logan was angling for some money as we told him that we would give him five bucks if he actually kissed one of the fish. This he tried until his face came within a couple of inches of the fish coming up to greet him. Then he decided that the money might not be worth it. Haircuts around the Ward house have come a long way from where they began. Grandpa gave Trevor his first haircut when he was 7 months old - and he screamed his head off! Mommy or Daddy would have to hold him tight while Grandpa did his best to give him a little trim. We later coaxed him into the chair, but he would only sit still if he held a sucker. You can only imagine what that sucker looked like after the clippers got going. Ew! So here you see Trevor, 8 years later, totally relaxed - even enjoying spending time just talking with Grandpa. Logan was not as difficult as a baby. He would struggle a little bit, but always liked to sit still like his big brother. Here's a good BEFORE shot - always the cheese nut. Logan almost started to drift off into sleep while Grandpa worked away. But he did his best to stay awake till the end (his favorite part) because he knew that was when Grandpa would slap a crisp $1 bill into his hand - or a "tip" as Grandpa calls it. I don't know why this tradition started, but the kids look forward to it every time he comes. AFTER. And here they all are! Silly boys with silly new haircut faces. And do not worry! Jackson's curls will grow back! Thanks, Grandpa for the haircuts, the dollars and the good memories! "Bee" is for Book Club! The book for this month's book club meeting was The Secret Life of Bees by Sue Monk Kidd. We met at our house this time and had a surprisingly great turn out. 20 ladies showed up! We had a lovely dinner with LOTS of potatoes, cornbread, fried chicken and sweet potatoe pie. MM-mmm! We ate from pie tins, drank from mason jars and had Coke with peanuts as a tribute to the southern setting in our book. After dinner Kari led us in a discussion that got all the ladies talkin'. The only two you cannot see in the picture are Stacey and Tamera Clarke (they were hiding from the camera - silly girls!). Good book. Good turnout. Good night! Jackson is affectionately known around the Ward home as the "little monster". This is because he does what we imagine little monsters do, reek havoc and make messes. One evening during winter break I walked by the downstairs bathroom and noticed a shinning coming from the darkened bathroom. When I turned the light on, I was at first shocked and then a little (by little I mean a lot) upset to see the floor covered in a half-inch layer of water and toilet paper pieces. Upon further investigation, we found the remains of 3 toilet paper rolls inside the toilet. Apparently, Jackson had a good time stuffing and flushing. The worst part was that the water had been on the laminate floor for some time, causing it to expand and buckle. The remainder of my break was spent ripping up the bathroom floor, laying new tile flooring, and installing everything all over again. A few days after that we noticed that all of the fish in the kids' fish tank went belly up and died. We also noticed a weird rainbow like shimmer to on the top of the water. We discovered the culprit the next day when we watched Jackson take the hand soap from the kids bathroom and proceed to squirt it into the fish tank several times. I know many parents deal with the day to day messes children can make. Of course Jackson does these as well. It seems with Jackson that we have stepped into another realm. His ability to find new ways to inflict maximum damage are unprecedented in the Ward family. A couple of days ago, he figured out how to get on top the toilet in the kids bathroom, open the window latch, push out the screen, and proceed to throw bathroom items out of the window. Of course the grandma's say that he is "the cutest thing". They have yet to take us up on our offer of taking him for a few days to experience "the real thing". New Years Day brought the new tradition (second year in a row now) of doing the polar bear plunge in the pool with all the kids. With the water temperature in the low 40's, the plunge was especially chilly this year. In fact, the water was so cold survival instincts start kicking in when you hit that water. All the dad's jumped in as well and dang that water was cold. This year the Minnick's joined in as well. Matt even jumped in twice, although the second time he received some encouragement. Lizzie jumped in to her waist that was enough. A friend of my parents came over during the time that everyone was chanting for Robb to jump in and I could tell she was thinking, what kind sick ritual is this? Jeremy did a great Family Home Evening this week. He talked to us about the importance of setting and achieving goals. (This FHE may have been mostly for my benefit because of a small comment I made last week. I told Jeremy that I don't ever make New Year's resolutions because I know I'll never keep them!) He challenged us to think of 3 things we'd like to work on this year. Trevor, Logan, Mom and Dad all wrote down 3 goals we'd like to accomplish in 2008. (Well, he showed me! It was the "Triple Dog Dare" - will she commit? or look like a slacker in front of the kids? Of course I caved.) I thought it'd be a good idea to put them here for everyone to see and by so doing give the goals an added significance (and pressure to complete!). So check up on us if you please. Ask how we're doing. Help us keep these goals! And don't be shy... what were some of your resolutions? It happened on Christmas Day! We were so hoping it would happen - and it did!!! Logan's other front tooth came out. Er... Jeremy yanked it out is more like it. Don't worry. It was ready - wiggling all the way forward and back and even twisting a bit. He was so excited to sing, "All I want for Christmas is my two front teeth, my two front teeth, oh my two front teeth!" And do not fear...the tooth fairy was good to him this time around. She does not take off Christmas Day. So she absolutely came and left a whopping $2 under his pillow. My brothers have fits over this amount because when we were kids it was a quarter or fifty cents a tooth. hey love to point out, "That's like 200% inflation!" Yes it is. It sure is. How much did the tooth fairy leave you when you were a kid?